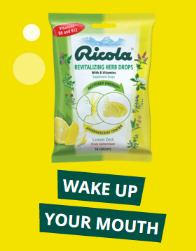 Ricola Wake Up Your Mouth Sweepstakes – Win a $500 gift card! ENTER SWEEPSTAKES HERE – Ricola Sweepstakes page. ENTRY LIMIT – One (1) entry per person and per e-mail or IP Address. ELIGIBILITY – The Ricola Wake Up Your Mouth Sweepstakes is open only to legal residents of the fifty (50) United States and the District of Columbia, who at the time of entry are at least eighteen (18) years of age. SWEEPSTAKES ENTRY PERIOD – The Sweepstakes begins January 18, 2016 at 11:00 a.m. U.S. Eastern Time (“ET”) and ends February 29, 2016 at 5:00 p.m. ET. PRIZES – One (1) Grand Prize is available. The Grand Prize is one (1) $500 American Express gift card.